WinStar Casino Review 2019 and Ratings with Casino Veteran. Some say he can make a roulette ball spin for as long as he looks at it, others that he can deal a deck of cards while upside down. He is the Casino Veteran and he thought it was high time that he checked out what WinStar Casino had to offer. Like most online casinos, WinStar tends to focus mainly on slots, but the table games they provide are high quality. They work with industry-leading gaming providers such as NetEnt and SoftBet, and their table and card games include lots of live dealer options thanks to BetGames TV. WinStar also has a partnership with GameAccount Network (GAN), which means they have a range of exclusive slots that you are unlikely to find elsewhere such as Starry Night and Dragon Pays. The Winstar casino allows players to fund their accounts in various ways including Visa, MasterCard, PayPal, Skrill and NETELLER. There is a low minimum deposit of just £10, and withdrawals are generally processed quickly by Winstar , usually within 48 hours. The Casino Veteran found WinStar to have a nice range of live dealer games, an easy-to-use interface and great animations. 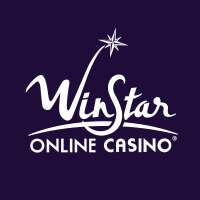 The Winstar website is well designed and user-friendly, with some clever features that make for an entertaining experience. This online casino has gone all-in to provide a high-quality mobile experience for their customers. Winstar Casino mobile app is available for iOS and Android devices and includes over 250 games, including lots of slots and various table games, as well as mobile jackpot games. The mobile app provides an experience that is just as good as the main site, and the developers have even added a few extra design flourishes exclusive to the app. The Casino Veteran was happy to see that all the standard bonuses and promotions available when playing via the Winstar website are also available from the app. WinStar online casino currently has an attractive welcome bonus for all new customers. You will receive a 100% matched welcome bonus of up to £100 on your first deposit and a 50% match on your next deposit of up to £150. You will also receive a total of 100 free spins, with 20 a day, available over your first 5 days of playing. There are ongoing bonuses for regular Winstar players as well. The Star Points programme allows all customers to earn extra credits as they play. As the name implies, this is based on a points system. Each player has to earn 100 points before they can be exchanged for a bonus payment. Check current Winstar Casino terms and conditions to see how games are weighted. Slots tend to contribute more, but most games are included in the programme. 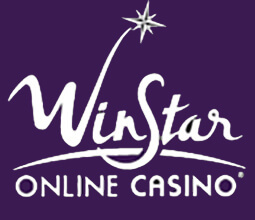 Most online casinos have wagering requirements when it comes to playing through bonuses, and WinStar is no exception. The Casino Veteran decided to visit the WinStar online casino for an evening, and he found plenty of fun and entertainment. He appreciated the quick and easy sign up, the generous matched deposit bonus and the free spins that were automatically added to his new account. He had a browse through the available games and was pleased to find a range of slots, including some new games he had not yet encountered, as well as the live dealer games he loves. He indulged in some live blackjack and then moved on to slots. He was pleased to find all his favourites were there, from Rainbow Riches to Coins of Egypt. 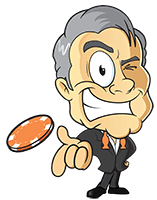 The Casino Veteran likes to play big, but he noted that the low minimum deposit is something that makes Winstar casino appealing to casual hobby gamblers as well as the high rollers.